A number of our teammates have opted not to own a car, and would previously travel through the city using Marta or ride-sharing apps. Now that these accessible and convenient e-scooters have popped up in our neighborhood, they’ve become our preferred method of transportation if the distance allows. 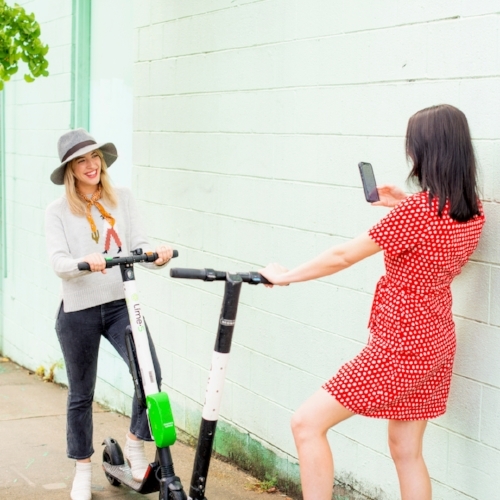 Whether we’re going to-and-from a meeting, a shoot location or running an errand, these e-scooters have made traveling for work-related matters much easier and cost effective. If you haven’t mustered the courage to hitch a ride on one of these motorized scooters yet, we highly recommend it! The app is very user-friendly and the scooters are not complicated to operate. Zooming around the city is a fun and welcome break from our day to day and has helped us continue to live out our core value, adventurous, as we scoot out of our comfort zones! We love exploring new places around the city and are grateful for this new trend that’s made the city even more accessible. Be on the lookout for the Imagineers zipping through Atlanta and let us know what you think after your first ride!